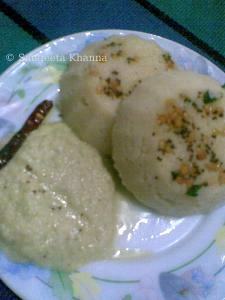 Rawa idli is made differently in each home and it is known as a short cut idli recipe. I have made it even shorter with steaming it in the bowl it is supposed to be served. 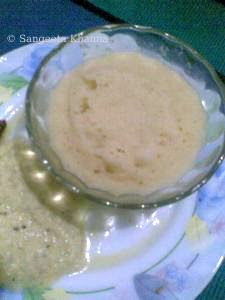 Rawa is semolina or sooji and is useful when you have kids around, it helps making some quick snacks and breakfasts. 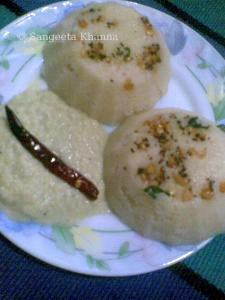 This rawa idli is a healthy fat free recipe. I have used a tempering as a garnish but it is optional and it is cooked in a very interesting way. 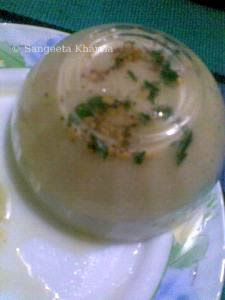 Normally people cook idlis in idli molds but in a microwave they can be cooked in glass or plastic bowls. 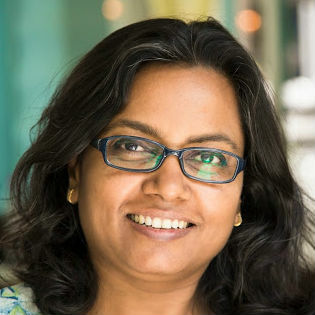 It is very convenient for me because if I have to make 4-5 idlis for two of us, I don't want to use the idli mold as it is not easy to clean it. On the other hand these bowls are easy to handle and one idli gets cooked in 1 minute if cooked covered. Apart from that this chutney is made with amla and is so tasty that it vanished without a trace, more over, coconut is high calorie, so using less of coconut n more of amla makes good sense for those counting their calories...read on. First prepare the tempering by heating all the ingredients in oil and keep aside. Now make a batter of all the ingredients for idli, let it stand for 5-10 minutes, in the meanwhile, put a little bit of the tempering in each of the bowls, it works as greasing and a garnish as well. when the idlis come out of the bowl, the tempering appears on top.....nice to see. Now spoon in the batter into the bowls and microwave each bowl covered for a minute on high..
let it cool for 2 minutes and take the idlis out with the help of a sharp knife,serve hot keeping the tempering side up with the chutney. Grind the amla and coconut first in a grinder as it takes more time, then put all the other ingredients into it and grind to make a fine paste, adding a little water. Serve this amla chutney with idlis liberally, make the idli meal spicy and tangy. Amla is a great antioxidant and helps supplement loads of Vit C to the system. This amla and coconut chutney is a great way to include it in everyday meals. Could you please tell me you covered the bowls with what in the microwave? Is it a must? @ Vasudha... i cover the bowls with a plastic lid which comes with microwavable plastic bowls...actually i buy the bowls just for the lids, i do not use the plastic bowls for cooking in MW but the lids don't come in contact with the food so it is okay to use them.a small ceramic or opal or even glass MW safe plate will good enough , plastic is convenient cuz it is light wt. and generally have a holder knob at the top. Covering the idli while cooking this way is must , because when cooked open they will turn dry on the edges and on top...hope the answer was clear to you.